To achieve the ultimate crunch AND 100% genuine Carolina flavor, we start with the finest potatoes available, then hand-cook them in small batch kettles using 100% Sunflower Oil. Our freshly cooked chips are seasoned to perfection with our unique source of real Carolina spices, herbs and flavors. All of our quality snacks are made to satisfy with bold tastes that reflect the traditional Southern recipes that will make your mouth water. Our snacks are handmade All-Natural, Gluten Free, Kosher Certified — Without Trans fats. 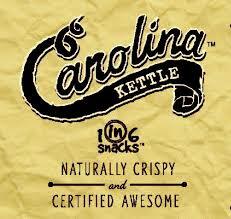 By using 100% Sunflower Oil, we ensure that every batch of Carolina Kettle chips are outrageously crunchy!